Joey Jordison: “I remember buying De Mysteriis Dom Sathanas a few months after it came out, and it was the equivalent of when I got Reign In Blood. 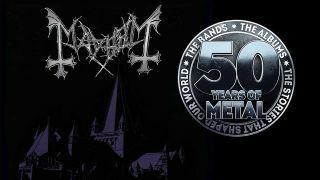 It was such a hugely influential record on me and on music as a whole – it’s a blueprint for so much black metal. ”Of course, with the history of Mayhem and the tragedies that surrounded them, it’s more than just a record. It’s a book. It’s so tied in with the individuals who made it and the time when they made it. You’re not just listening to music, you’re listening to a lifestyle. It’s not just the riffs or the drumming or the vocals – it’s something more than that. It’s got an atmosphere that’s totally alien, absolutely engulfing. When you put it on, you’re instantly transported somewhere else.